This model is two times larger than life size, so it's a great introduction to the structure of the human heart. The ventricles and auricles section through the model, so users can study internal anatomy and trace the path of blood flow. 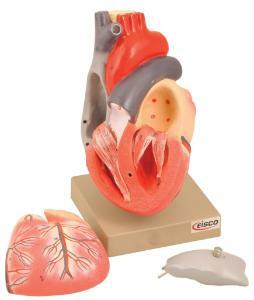 The model includes a key card that highlights all the major structures of a heart including veins, arteries, and valves.